Walk to Town & Beach! 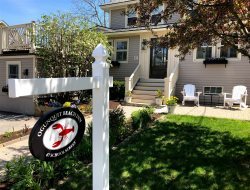 School St. Ogunquit 5 Bedrooms, 4 Baths resort-like home a short walk to the beach! OCEAN TOWERS CONDOMINIUM #204: This upper floor, one bedroom condo unit has a king size bed, and a full size fold out sleeper couch. Accented with cathedral ceilings and skylights, the modern kitchen has all the conveniences of home. Two air conditioners and ceiling fans will keep you comfortable during your stay. There is a large screen TV with a DVD player in the living room as well as a TV in the bedroom. Ocean Towers condo complex is conveniently located on Route 1 just a short ½ mile walk to the downtown area and the famous Ogunquit beach. This unit overlooks the pool which offers beach chairs, and lounge chairs for those days after the beach! Leave the car behind and hop on the Trolley in front of the condo for an easy alternative to getting to the beach, shops, galleries and restaurants. Nearby you can check out the movie theater (walking distance), miniature golf, bowling, antique stores, night life or simply kick back and relax with a cold drink at the condo and play board games or watch DVD’s (both supplied). This is a true vacation getaway with all the amenities of your home! Don’t forget to eat a Maine lobster at one of the many local seafood restaurants!! !